Softing Inc. today introduces the XpertClean line of fiber optic cleaning kits complete with a cleaning process for fiber cable certifiers, IT managers, and network troubleshooters. 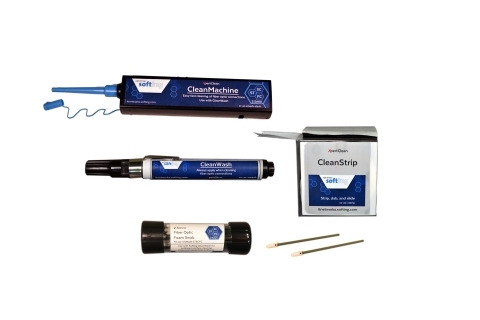 XpertClean kits come complete with cleaning essentials targeted for 2.5 mm ST, SC, and FC connectors, 1.25 mm LC connectors, and MPO fiber optic connectors. XpertClean kits contain the required fiber optic cleaning tools as part of a complete in-field solution when used with the Softing line of testers, including WireXpert, NetXpert, and FiberXpert. Softing AG is a leading global provider of products for Industrial Automation, IT Networks, and Automotive Electronics. For over 30 years, the core business of Softing has been industrial data communication and connectivity in the form of OEM chips, development stacks, software connectivity suites, communication gateways, and PLC in-chassis modules to get you connected. To help you stay connected, Softing offers network health test and monitoring tools in the form of permanently installed monitors to handheld testers like the WireXpert, NetXpert, and the FiberXpert. Softing AG is a publicly traded company on the Frankfurt Stock Exchange, was founded in 1979, and is headquartered in Haar, Germany near Munich. In fiscal 2017, Softing employed 415 employees and had a turnover of 80 million euros. Softing Inc is the North American headquarters located in Knoxville, TN USA.